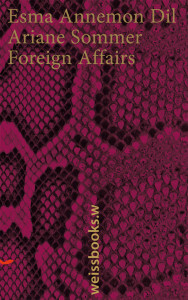 “Foreign Affairs” was released on the German speaking markets to great reviews and media acclaim. In thirty-four edgy short stories authors Ariane Sommer and Esma Dil dissect modern illusions of happiness and success as well as gender roles. The plot leads the female protagonists to some of the world’s most desirable locations and often times astray; Woman meets man in Shanghai, in a Russian nightclub, in the catacombs of Paris or an Arabian oasis. What lingers after each of these encounters is the foreboding that some of destiny’s gifts come at a high price.